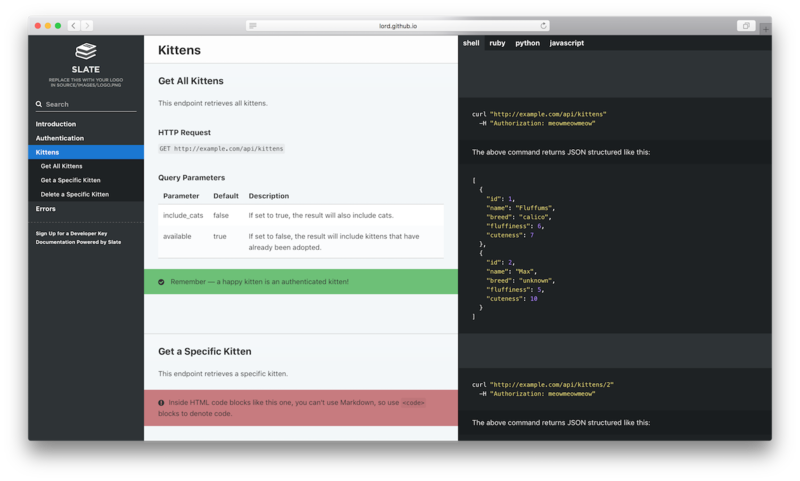 Slate helps you create beautiful, intelligent, responsive API documentation. The example above was created with Slate. Check it out at lord.github.io/slate. Clean, intuitive design — With Slate, the description of your API is on the left side of your documentation, and all the code examples are on the right side. Inspired by Stripe's and Paypal's API docs. Slate is responsive, so it looks great on tablets, phones, and even in print. Everything on a single page — Gone are the days when your users had to search through a million pages to find what they wanted. Slate puts the entire documentation on a single page. We haven't sacrificed linkability, though. As you scroll, your browser's hash will update to the nearest header, so linking to a particular point in the documentation is still natural and easy. Slate is just Markdown — When you write docs with Slate, you're just writing Markdown, which makes it simple to edit and understand. Everything is written in Markdown — even the code samples are just Markdown code blocks. Write code samples in multiple languages — If your API has bindings in multiple programming languages, you can easily put in tabs to switch between them. In your document, you'll distinguish different languages by specifying the language name at the top of each code block, just like with Github Flavored Markdown. Out-of-the-box syntax highlighting for over 100 languages, no configuration required. Automatic, smoothly scrolling table of contents on the far left of the page. As you scroll, it displays your current position in the document. It's fast, too. We're using Slate at TripIt to build documentation for our new API, where our table of contents has over 180 entries. We've made sure that the performance remains excellent, even for larger documents. Let your users update your documentation for you — By default, your Slate-generated documentation is hosted in a public Github repository. Not only does this mean you get free hosting for your docs with Github Pages, but it also makes it simple for other developers to make pull requests to your docs if they find typos or other problems. Of course, if you don't want to use GitHub, you're also welcome to host your docs elsewhere. Getting started with Slate is super easy! Simply fork this repository and follow the instructions below. Or, if you'd like to check out what Slate is capable of, take a look at the sample docs. Linux or OS X — Windows may work, but is unsupported. Bundler — If Ruby is already installed, but the bundle command doesn't work, just run gem install bundler in a terminal. Fork this repository on Github. You can now see the docs at http://localhost:4567. Whoa! That was fast! Now that Slate is all set up on your machine, you'll probably want to learn more about editing Slate markdown, or how to publish your docs. If you'd prefer to use Docker, instructions are available in the wiki. You can view more in the list on the wiki. Submit an issue to the Slate Github if you need any help. And, of course, feel free to submit pull requests with bug fixes or changes. Slate was built by Robert Lord while interning at TripIt. Also, thanks to Sauce Labs for sponsoring the development of the responsive styles.